Calvin dedicated most of his youth to the study of humanitarian subjects developing clear views of what the religious life consisted of. He moved to Geneva in order to escape persecutions and was eventually able to reform the church. During the XVI century, the Church was decadent and preoccupied with materialistic matters. Calvin desired to create a community that truly worshipped God and his word. In his view, people should serve God in every sphere of life (education, economy, politics). According to Calvinism, not everyone is entitled to eternal salvation: only a few have been chosen by God. For this reason, indulgences, relics, and conforming to the Church’s tradition, do not guarantee a spot in heaven. Notwithstanding decades of persecution, Calvinism managed to establish itself across Europe. 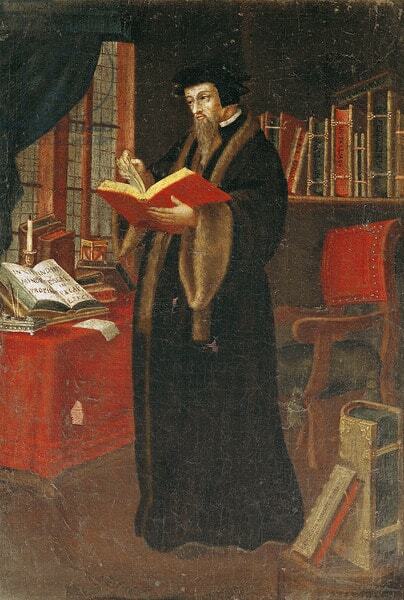 John Calvin was born in Noyon (a town in northern France, fifty miles away from Paris) on July 1509. His mother descended from a noble Belgian family, whereas his father covered many prominent positions both within the church and society. Calvin received a brilliant education which comprehended the study of logic and other humanistic subjects at the College Montaigu (Paris) (Collier’s Encyclopaedia). Although at the age of thirteen he was destined to an ecclesiastical path, he decided to undertake Law studies. However, Calvin did not neglect to study literature and other humanistic subjects. In fact, it is during this period that he becomes deeply acquainted with ancient authors of the Latin and Greek period, and ends up writing a commentary on Seneca’s De Clementia (1532) (Collier’s Encyclopaedia). He also undertook a detailed study of the Bible and read Martin Luther’s Ninety-five Theses against Indulgences (1517). In 1533, strong persecutions against the Evangelicals started in Paris, and Calvin was obliged to flee from the city in order to avoid imprisonment or death. Therefore, he started adopting various pseudonyms such as ‘Angoulême, Nérac, Poitiers, Orléans, and Claix’ (Collier’s Encyclopaedia) in order to keep expressing his ideas freely. However, he was eventually forced to move to Strasburg and Basel, where he met individuals who had contributed to the Reformation started by Martin Luther. 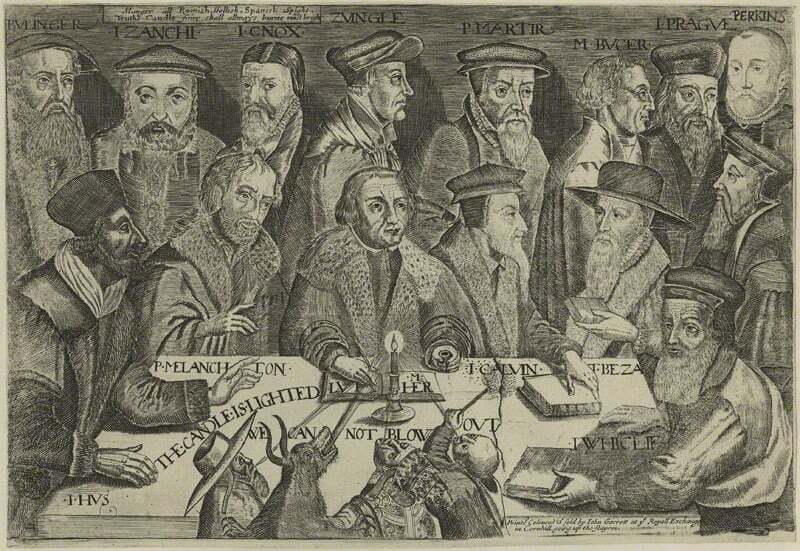 In 1536, Calvin completed one of his most important theological works, the Institutes of the Christian Religion (written in Latin and dedicated to the French monarch Francis I) in which he criticised the Roman Catholic Church and defended Luther’s ideas. During the same year, Calvin travelled between the Duchess of Ferrara (in Italy) and his birth-town Noyon. However, the war between the Spanish Emperor Charles V and Francis I, forced him to settle in Geneva. In the Swiss town Calvin was known for his works and mission, therefore, William Farel – who had started the Reformation in Geneva – asked him to teach the Holy Scriptures and spread the principles of the Reformation. Notwithstanding his shy character, Calvin undertook this task only because he believed ‘God was really commanding him to further the Reformation in Geneva’ (Collier’s Encyclopaedia). However, the medieval town was not ready for his reforms, and as a consequence, Calvin and Farel were expelled from Geneva and were obliged to move to Strasburg. Following internal conflicts, the people of Geneva realised what Calvin’s intentions in regards to the Church were, and they convinced him to return by ensuring the introduction of what he had previously demanded (Arnold 1999). Firstly, he set up a new, strict church order (1541), then ‘a fixed order of worship’ (1542), and finally, he introduced a new catechism (Collier’s Encyclopaedia). Calvin succeeded in his intention of creating an evangelical church that included ‘the service of God in everyday things’ such as in education, in charity work, and in the political life. Essentially, everything revolved around God and he desired a community that would ‘make the world a Theatrum gloriae Dei’ (i.e. ‘a spectacle of God’s glory’) (Collier’s Encyclopaedia). Moreover, Calvin introduced four offices within the church. These were: (I) pastors, who had the duty of preaching God’s word along with the (II) teachers; the (III) elders, who regulated and ensured correct conduct; and the (IV) deacons, who assisted the poor and the pastors (Arnold 1999). Until his early death in 1564 (at the age of 55), Calvin’s main objective was that of spreading his theology and church government across Europe. In fact, he desired Geneva to set an example to other countries such as France, Scotland, England, the Netherlands, Poland, and Transylvania – to name a few (Collier’s Encyclopaedia). In order to understand why Calvin (as well as his predecessor Luther) were crucial figures, it is necessary to depict the state of corruption that the Roman Catholic Church was in. In fact, in Western Europe, the church not only held the spiritual power but also the political power (also known as temporal power) since it possessed a number of territories in Italy referred to as the Papal States (Zucker and Harris). Moreover, far from living in modesty and humility, the church was at the pinnacle of corruption (for example, during the Western Schism between 1378-1417 three popes ruled at the same time). Over time, the Church’s materialistic ambitions became more and more obvious: simony – which consisted in buying/selling positions within the church, and nepotism – the act of assigning church roles to members of one’s family, started to become the normality. For instance, Pope Alexander VI (who belonged to the powerful and corrupt Italian Borgia family), not only had six children and several mistresses but also was able to bribe votes and by the papal office. In essence, the Church lived in a state of lavish abundance, surrounded by incredible riches, art, and power. As a matter of fact, ‘popes and cardinals often lived more than kings than spiritual leaders’ (Zucker and Harris). With all the focus placed on the material, the spiritual side had been left out of the equation, and it was the German monk Martin Luther that became genuinely concerned about people’s soul and salvation. It is during the reading on the Old Testament that Luther discovers that ‘the righteous will live by faith’ and that salvation is not ensured when following precepts and traditions established by an institution. Rather, it is a personal journey. For this reason, the church’s scams and manners to acquire wealth became undeniable. The indulgences were letters sold by the church that had the purpose of absolving sins and insure eternal heaven (in some cases people bought indulgences to forgive sins that they had not yet committed!). Relics were ‘a piece of Christ’s cross, Christ’s blood in a bottle, some nails from the cross and saints’ bones’, and the vendors were obliged to purchase a license from the Church before selling them (Burchill et al. 2019). By selling “fakes” the Church would make money – in fact, the population during that time was highly superstitious and believed that by purchasing a relic they ‘would reduce [their] time spent in purgatory after death’ (Burchill et al. 2019). It is in this atmosphere that Calvin realises the loss of an ethical spiritual community devoted to God and his word. “First I was devoted to this superstition of Papism so obstinately that it was not easy to draw myself out of this abyss. But by a sudden turning, God subdued my heart to obedience” (Collier’s Encyclopaedia; citing Calvin). Calvin believed that at the beginning of time, God chose the people that should be saved, and those who shouldn’t. Therefore, Calvinism is based on the idea of predestination – and this is one of the reasons why the Catholic Church’s decadence and materialistic concerns were vehemently rejected. Calvin’s beliefs consisted in the fact that ‘you cannot manipulate God, nor put Him in your debt. If you are saved, it is his doing, not your own’ (christianity.com). Calvinist ideologies can be remembered with the acronym TULIP. ‘Man’s heart is evil (Mark: 21-23) and sick (Jer. 17:9). Man is a slave of sin (Rom. 6:20). He does not seek for God (Rom. 3:10-12). And, is by nature a child of wrath (Eph. 2:3) (Slick 2012). Unconditional Election – considering people’s inherent evilness, God decides who is predestined. Therefore, some will be entitled to salvation after death, and some will not. In the Calvinists’ view, nothing can be done to change the outcome. Limited Atonement – Jesus did not die to save everyone from their sins. He sacrificed himself for few. Irresistible Grace – God is merciful to all beings. However, he ‘extends an internal call [that] cannot be resisted’ only to few elects (Slick 2012). Perseverance of the Saints – Since God has chosen you, salvation cannot be lost. So how would you recognise a predestined? What were the criteria? According to Calvin, anyone that lived a moral and ethical life was most likely one of God’s elects. Calvinism attracted many intellectuals and people belonging to the French elite, and by 1562, over two million people were Calvinists. Here, Calvinists were known as Huguenots, and notwithstanding the hostile persecutions they had to endure, they held ‘congregations [since the] mid-XVI century’ (Fitzgerald 2004). One of the most bloody and brutal persecutions is known as the St. Bartholomew Day Massacre which happened in 1572 by order of Catherine de Medici: in three days, over 70,000 Huguenots in France were tortured and murdered in cities across France (history.com). It was only in 1598, with the Edict of Nantes signed by the French king Henry IV, that the Huguenots (i.e. French Calvinists) and the Protestants were ensured religious tolerance. However, such peace did not last long, and in 1643, when Louis XIV became king of France, persecutions became the norm once again. Such dramatic events caused many Huguenots to abandon France and flee to England, Germany, and the Netherlands. Although in the Netherlands Calvinism and other evangelical beliefs were banned, Calvin’s doctrine managed to spread nonetheless. Here, one could be arrested for only ‘possessing a Bible published in Dutch, or a book written by Luther or Calvin’ (Johnston 2011). However, people started secretly meeting up in order to discuss the Holy Scriptures and prayer. Since 1556, Johannes Lasco (considered a heretic), contributed to spreading the teachings of Calvinism and the Reformation across Poland. In fact – although not successful in his intent – Lasco’s primary intention was that of ‘uniting Evangelical and Protestant religions in Poland into one national Church’ (Kloczowski 2000). Here, the number of Calvinists was less than Lutherans and was especially appealing to the noble part of the population. One of the factors that prevented Calvinism to have a more decisive impact on Poland, was the language barrier. In fact, German was not spoken by most Polish people, and therefore, the Calvinist message did not penetrate as deep as in other countries. The Warsaw Confederation signed in 1573, put an end to the religious persecutions, and since then Poland became a place where other European persecuted people could find peace. [1.] Arnold, J. L. (1999). 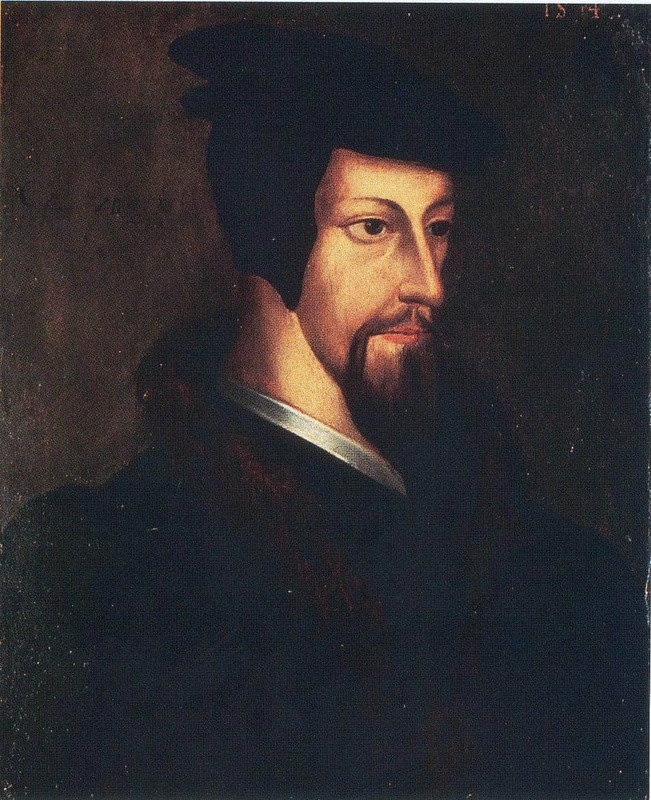 John Calvin: From the Second Reform in Geneva to Death (1541 – 1564). IIIM Magazine Online. 1(8). [2.] Burchill, S. et al. (2019). The Church before the Reformation. [Online] Available from: http://www.saburchill.com/history/chapters/chap5102.html [Accessed 9 January 2019]. [3.] Christianity.com (no date). What is Calvinism? Understanding the history and denominational doctrine. [Online] Available from: https://www.christianity.com/church/denominations/what-is-calvinism.html [Accessed 9 January 2019]. [4.] Collier’s Encyclopaedia (1967). Calvin, John. [Encyclopaedia Entry]. Volume 5. Crowell Collier and MacMillan, Inc. [5.] Editors of Encyclopaedia Britannica (no date). Western Schism. [Online] Britannica. Available from: https://www.britannica.com/event/Western-Schism [Accessed 9 January 2019]. [6.] Fitzgerald, T. E. (2004). The Ecumenical Movement: An Introductory History. USA: Praeger Publishers. [7.] History.com Editors (2018). Huguenots History. [Online] Available from: https://www.history.com/topics/france/huguenots [Accessed 9 January 2019]. [8.] Johnson, A. (2011). The Spread of Colonialism. [Online] Think Theology. Available from: https://thinktheology.co.uk/blog/article/the-spread-of-calvinism [Accessed 9 January 2019]. [10.] Zucker, S. and Harris, B. (no date). An introduction to the Protestant Reformation [Online] Available from: https://www.khanacademy.org/humanities/world-history/renaissance-and-reformation/protestant-reformation/a/an-introduction-to-the-protestant-reformation [Accessed 9 January 2019].